It’s nearly a year since I left university and I find myself thinking about this year’s graduates. The class of 2014. I can see them now, celebrating with champagne, shots and even the odd bottle of cheap vodka. No one has told them about the frustration of completing a 14 page job application form or the shame of walking into the job centre for the first time. University doesn’t warn you about the challenges that lay ahead or prepare you for starting work. Like me, you will have to learn from experience. What they don’t tell you is learning from experiencing is slow, painful and tiring. You are going to have times when you wan’t to give up but you can’t. You have a degree, now you must create a life. I never realised how important social media was until I started working. It has created a 24/7 lifestyle that we all get sucked into. It’s not enough to talk to colleagues in the office. They also spend their evenings commenting and liking your Facebook statuses. The noisy ones will just enjoy getting an insight into your private life. Ignoring a Facebook request from a colleague, is just as serious as ignoring their good morning greeting. You are expected to show that you are social in all aspects of your life. This means there should be no pictures of drug use (yes weed is a drug), delete that drunken twerking video and any racist or discriminatory updates. You are supposed to be a educated individual with a view on current affairs and company strategy. Ok, I might have taken it a bit far but you get the picture. When you enter the working world, social media is suppose to expand your network and create opportunities. 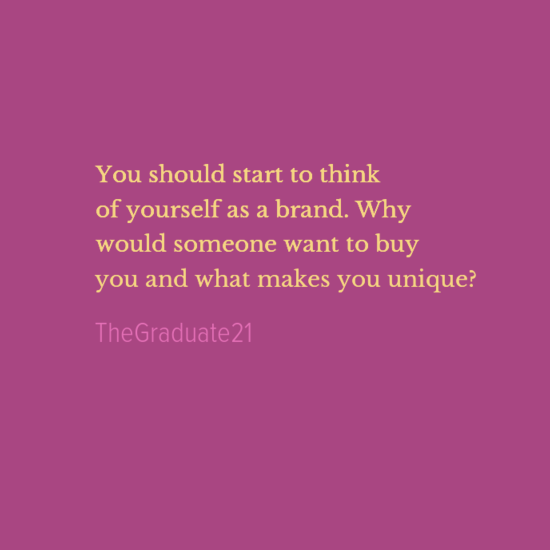 You should start to think of yourself as a brand. Why would someone want to buy you and what makes you unique? Use your social media networks to create and improve your reputation in the real and virtual worlds. If your looking for a job it’s equally important to have a professional online persona. Companies may search for you on Facebook and you don’t want them to cross you off their interview list because of your profile. You might be thinking, “this doesn’t apply to me, my profile is private”. Nothing is private and there is always ways to find out information about someone. Privacy settings have lured most of us into a false sense of security. The best way to think is, if you post it, it’s public. Don’t let your social media activity ruin your job prospects or your career. After three years of essay writing I’m sure most of you think you know how to write. Unfortunately, good writing skills can only get you so far- you need to learn how to sell yourself. You need to do more then mention the traditional buzz words. If you are a team player prove it. What makes you think your creative, have you ever shown this before? 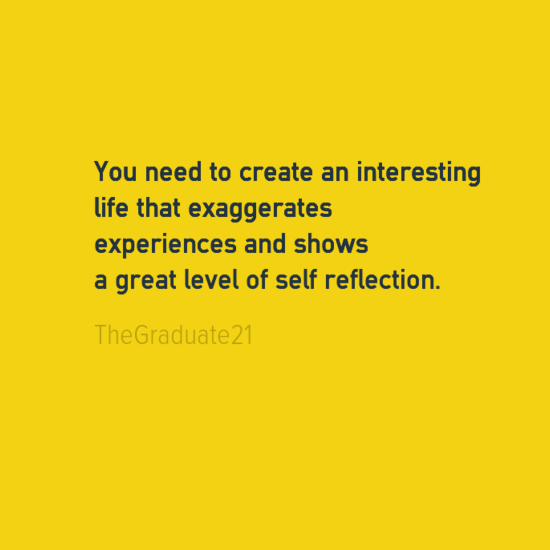 You need to create an interesting life that exaggerates experiences and shows a great level of self reflection. You also need to show that you are willing to learn. No manger want’s to hire someone who is likely to replace them in a few years. Even if you do, you need to pretend that you live for this role and there couldn’t be anyone better for it. Take your time to carefully read and analyse the job specification. If you don’t have two years experience then you shouldn’t waste your time applying. It’s good to be ambitious but it’s also important to be realistic. Can you see how this role is integral to the company as a whole? It’s time to do your research. Find out the origins of the company and their core values. Do they have a staff page on their website? If they do have a look at their social media profiles. You might be able to pick up a few clues on the type of working environment that company has. This could be particularly useful in a company with a young team or a media focus. When you have finished your application send it to a friend to proof read and critique. Listen to their feedback and make the changes. It should take you at least three days to finalise an application form. If you have any friends who have recently got jobs ask them for tips, these could be invaluable. This is a time consuming process but if your lucky you might get a job at the end of it. Depression is more then having a few bad moods and feeling down. If you are depressed, you will feel upset/sad/distressed most of the time and life will begin to feel hopeless. The graduates who struggle to find work may find themselves getting depressed. If you are in this situation try and keep yourself busy by maintaining your hobbies and visiting family and friends. Depression can really take hold if you start to feel isolated. I remember when I realised I was starting to feel hopeless. My parents were leaving for work and I began to cry, clinging to my mum like a child. I didn’t want her to go into the world when I felt like I couldn’t participate in life. There’s nothing you can do about these feelings, you will just have to feel them. The important thing is to remember that negative voice in your head is lying to you. 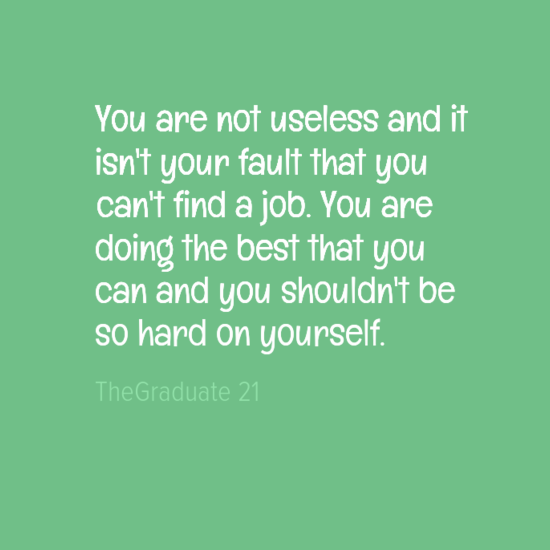 You are not useless and it isn’t your fault that you can’t find a job. You are doing the best that you can and you shouldn’t be so hard on yourself. Some graduates may think starting work will eliminate all their problems- wrong. If anything work can make your problems more apparent. The jump from student to professional is massive and I still find that hard to deal with. You have spent the last three years working on your dreams, partying and sleeping in until noon. Now you have to get up, get out and spend your best hours working. You might hate your job or love it. Either way you are unlikely to feel completely fulfilled. This is because work is unable to fulfil you as a person. In order to feel content you have to have a good work/life balance. To get this there will be much trial and error. This could bring you down. Again, go and speak to someone. A close friend or family member is the best place to start. If things don’t improve you should visit your GP and they will go through your options. Through this dark stage in your life, you should use your good days to push you forward. When I was studying I used to dream about getting a secure job and earning a proper wage. That has happened and I still don’t feel that I have achieved my full potential. There is so much I want to achieve in my life that it can feel overwhelming. One of my first mistakes was thinking that my job was a barrier to my dreams. All jobs (no matter how crap) enable you to earn enough money to live and save. Going travelling may seem like a big dream but it will become impossible if you are unemployed. You shouldn’t stop living just because you are not where you want to be in your life. 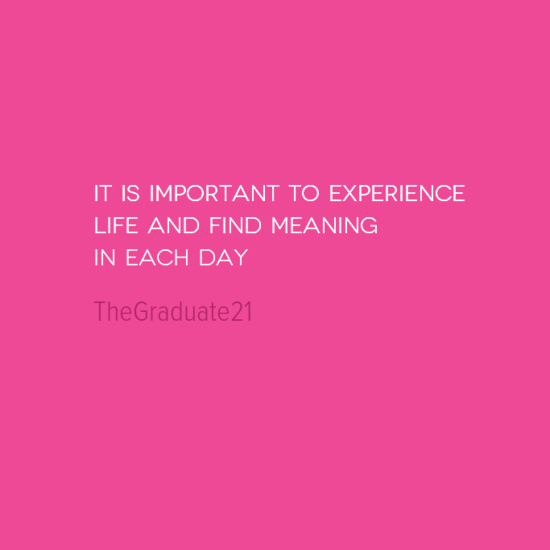 It is important to experience life and find meaning in each day. Life is made up of a series of moments and each one is important. If your working, take your lunch break to get some fresh air. If your lucky enough to be unemployed try and get your wildest ideas off the ground. Think about what you want and how you will get there. Don’t let go of your dreams just because you can’t achieve them in a day, week, month or year. In order to get to where you want to be you will have to work hard. That might mean being the last one in the office, the first one awake in the morning or giving up your weekends to develop your ideas. Some days are going to be more productive then others. You might have months where you don’t work on the dream. This doesn’t matter, it means that you have chosen to fully experience life instead. Personally, I don’t have any goals for the rest of the year. I just want to live. You have to do what’s right for you. When life gets hard, it’s easy to feel like it’s everyone else’s fault. This isn’t true. Your life is created by you and you should take responsibility for it. You shouldn’t compare yourself to others-although I know this is hard to do. I find limiting my social media use helps me feel like I have better control of my life. I don’t want to waste my time thinking about unattainable things or watch other people living. You need to create a life that you can live with. You should surround yourself with positive people because they tend to be more in control of their lives. They won’t do things to please others or spend time complaining. Complaining about your life is the worst thing that you can do. I used to do it all the time and it only made me feel worse. Write down your fears/complaints and share your joys. Spread happiness and you will get it back. In these hard times you must learn how deal with disappointment and moments of unhappiness. You must keep going and remember that things will get better. This blog is filled with all the things I wish someone had told me when I graduated. Real life was a shock to my system and I still have days where I think I may never recover. I know I will recover and so will you.